This mixture of experience, knowledge, skill and training all contribute to the appraiser's ability to appropriately and thoroughly identify and understand the appraisal situation and then to provide an appraisal that meets USPAP criteria in the 5 areas of accuracy, reasonableness, relevance, adequacy and completeness, as discussed in USAP Comments regarding Standards Rule 3-3(a). It turns out that directly judging an appraiser's competency can be a tricky and unrewarding process as well as exposing the reviewer to charges of liable and defamation. A more pertinent and useful approach in appraisal review is to focus on reviewing the appraisal-not the appraiser-using the 5 qualities suggested by USPAP. For instance, in an appraisal review report we recently reviewed for the Appraisal Review designation process of theAmerican Society of Appraisers, our reviewer spent several pages explaining why the appraiser who wrote the report under review was incompetent to provide the valuation on this particular type of equipment. Buried later in the report was a complete expose of the appraiser's documented misunderstanding of the equipment being appraised. By re-framing the report to focus on the lack of accuracy, relevance and adequacy in the equipment description, the reviewer was able to "show not tell," leading readers to their own conclusion of incompetency. This change in focus created a clearer review report. Just as importantly, eliminating all statements charging incompetency freed the reviewer from fear of being charged with libel or defamation. Believe it or not, this is an important consideration in appraisal review practice! An Appraisal Institute article states that defamation lawsuits targeting appraisal reviews are on the rise and suggests that "The best way to minimize the risk of a defamation claim is to stick to the assignment and simply review the appraisal." In the American Society of Appraisers Appraisal Review classes (ARM 201 & 204), we emphasize that this means reviewing the appraisal report and not the appraiser who produced it. An appraiser's job is to present a report that clearly and competently explains a story of value. 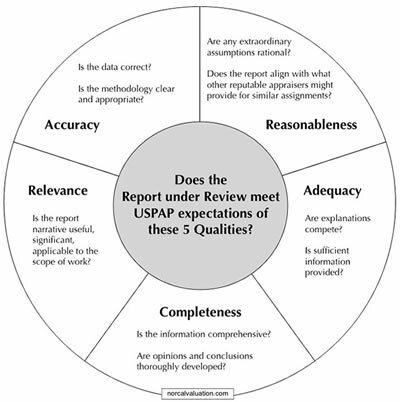 An appraisal reviewer's job is to gauge the degree to which that story is supported within prescribed USPAP limits of accuracy, reasonableness, relevance, adequacy and completeness.